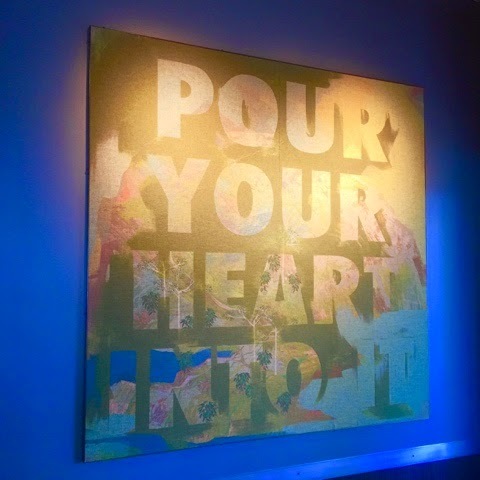 A painting at Starbucks that I thought fit. My husband's cousin recently died of a brain aneurysm. His younger sister who lost both her brother and mother in the past year was visiting my husband's home town and wanted us to visit while they were visiting. We bought a ticket and flew there for the weekend. It helped my husband as well as his cousin process the deaths. The challenge is that when we are away from home regular monitoring of TsukiMoon's food becomes unbalanced. We were only there for two nights but his sleep and routine was upset. Many of his words to left him and he went to one word demands. We got back today, Monday, and it didn't get better. He was a basket case tonight. He didn't want to do his homework, almost cried about it. There was a time when he wasn't taking the drug-trial medicine that he would have cried, hit, and been inconsolable. So we can say that there has been improvement due to the meds. We did learn that the vasopressin doesn't over-ride all the changes; irregular routine, less sleep, and a switch from as strict gluten-free and dairy-free diet to a frappuccino and bread free-for-all. It was a good lesson. I was curious if the medicine would overcome the strict food plan. I would like it if I didn't have to act as the hard-boiled food director. Well, no, not yet. He did some stimming when we got home but he didn't do it up there. Again a positive change. He went to bed with his chewy. He didn't lip us (where he puts his mouth on us) or grab us under the chin (a calming-pinching motion he started when he was a breast-feeding baby). Small successes.